I was working on my new set of bright skins, and i needed some place to test them out. typical yellow/reddish, white - neutral, kind of blue, and no light (there is some luminescence from the sky, about 15). nature. Form must follow function! Function is The Game! So i've placed there few boxes. just to keep the size, but expand jump possibilities. Symmetrical teleports on sides came to me by itself. My older map, Pac-Man, is rooted in my mind. but made in real Quake 2 style. I'm proud of it. after time it may leads to something great. to make a central mystery box. And here it is, small in size, but big in playfulness / playability. Give it a try and say what you think. Hell ya! Thank you Fryziu !! Will be back with map report soon. Join Quake Legacy Mod Revival Discord! it is a very small and tight map. was this made just for DM? Yes, it is a fun map, that is quite good for Free For All, actually it's just a single chamber. Let's take another one, glue them together, put two flags and voila - new CTF map is ready! CTF is using the same engine, same weapons, same physics, but rules are different. It's a different game, like checkers and chess. Gluing together two DM maps doesn't work. Amount of work grows exponentially. "Gluing" them means creating another chamber that wil connect them in sensible way. And "Creating" is the key here. It's not something you do, it's something that comes to you. This stuff takes time, days of trial and error, testing and modifying, and testing again. My day has only 24 hours, and i have other stuff to do as well. 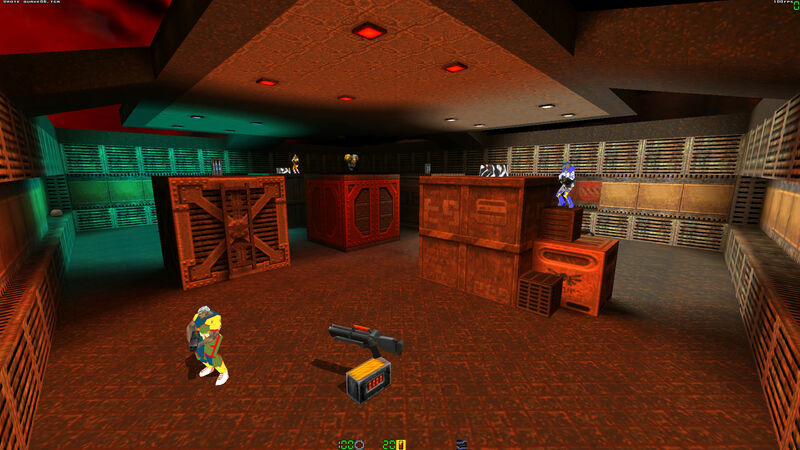 Quake 2 is for fun, so it has to be funny, and funny it is when satisfying things comes out of it. It happens only from time to time. and spare time will be generated to put this idea into practice. and they will spend their time on it, valuable time of fun and joy. So it has to be === Good. that second map you showed in video thats just 1 room with lots of ramps and angles looks fun! other projects you are working on look like they could turn into something nice too keep up all the good work man! Just need to make a little YouTube video for it, and release it.